It is while sleeping that the skin repairs damage caused during the day, this is when the resting cell renewal takes place. 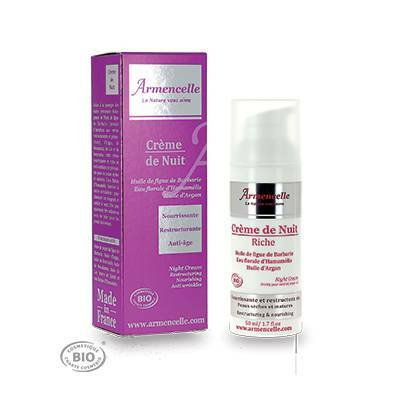 The Armencelle nourishing night cream is a carefully formulated cream made from a base of organic vegetable oils, they nourish and repair dry and mature skin. This complex product effectively fights against skin ageing and the signs of passing time. The result upon waking is a comfortable, smooth and radiant complexion looking more youthful. Non-greasy texture, subtle scent of almond. Ingredients: Aqua, triticulum vulgare straw water*, hamamelis virginia leaf water*, macadamia ternifolia seed oil*, coco caprylate caprate, borago officinalis seed oil*, butyrospermum parkii butter*, cetearyl alcohol, behenyl alcohol, glycerin, argania spinosa kernel oil*, opuntia ficus indica seed oil*, linum usitatissinum seed oil*, glyceryl stearate citrate, cetearyl glucoside, glyceryl caprylate,tapioca starch*, parfum, tocopherol, benzyl alcohol,potassium sorbate, sodium benzoate, dehydroacetic acid,citric acid, citronellol, linalool.